New company offsets the cost of upgrading to the GTX 1080 by purchasing used GPUs. 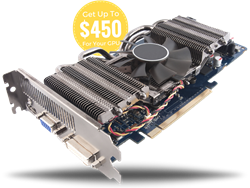 We are giving individuals who need high-end graphics the power to safely and quickly sell their GPUs, making the upgrade process easier and more affordable. A new tech firm is set to revolutionize the graphics card industry by purchasing GPUs directly from consumers through a fast, easy-to-use, and zero-risk process. SellGPU.com, a company of gamers, programmers, and hardware enthusiasts, was established to help individuals with the need for high-end PC components dispose of their old GPUs. Founder and CEO Said Hafez created the company in late 2014 after finding difficulty in getting rid of an old GPU batch. SellGPU offers its customers instant quotes. After the customer accepts the offer, he or she will have the option to receive a free anti-static foam box and prepaid shipping label with which to send the GPU. The customer then simply places the GPU in the box, tapes the box, affixes the shipping label to it, and drops it off at any local post office. Once the GPU reaches SellGPU, it gets inspected and tested. If it passes the testing process, the customer gets paid by PayPal or check within three business days. If the GPU fails the tests, SellGPU returns it free of charge. Gamers upgrading to the GTX 1070, GTX 1080, or the Radeon RX 480 have been receiving up to $92 for a GTX 960, up to $158 for a GTX 970, and up to $212 for a GTX 980.